We see them, hear them, and empower them to succeed. Our purpose is to equip families experiencing homelessness in Wake County with resources and services to nurture the healthy growth and development of their children. Do you see the smiling face above? That's why we do what we do. Children experiencing homelessness are the most vulnerable in our society, yet they go unseen, unheard, and underserved. That's why The Salvation Army started Project CATCH. These children's hopes and dreams are in jeopardy of going unrealized. But we see them, hear them, and strive to empower them. To really understand what we do, you need to experience our mission in action, and meet the wonderful people we work with day in and day out. We have several opportunities for you to volunteer with the children we serve. Sign up today! Although we're able to impact hundreds of children & families each year, the need is great. We simply can't get to everyone. 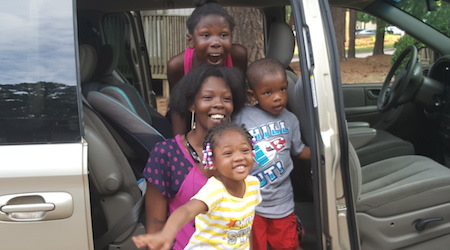 Invest in our work today to support families experiencing homelessness in Wake County! Crammed into a hotel room with their parents and siblings, the children we serve worry about things like the house cleaning staff banging on their door early in the morning and keeping their voices down as not to disturb the people on the other side of their paper thin walls. This is their story in pictures. Learn about Project CATCH, talk to a family we've served, volunteer with children currently experiencing homelessness as their parents attend a workshop to help them better meet the needs of their children. We can always use help. Whether it's organizing our donation space, copying brochures, making copies of articles, taking notes at meetings, serving on our Advisory Council's Marketing Committee, assisting our case manager with searching for camp summer scholarship opportunities, there is a lot to be done to help children experiencing homelessness in Wake County. If interested, please reach out to Kim today. 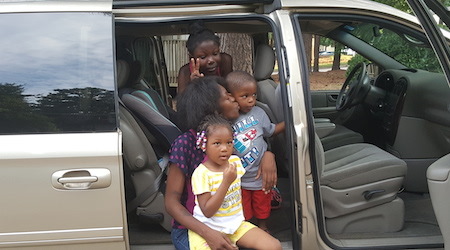 Once a month we share an encouraging story about one of the family's we've served or our thoughts about compelling data around child homelessness. "I don't know where we'd be without Project CATCH"
WRAL's Brian Shrader visits with Project CATCH and an incredible family working hard to change their circumstances. A story about a local family and how Project CATCH was able to help them through the difficult loss of their brother and son.